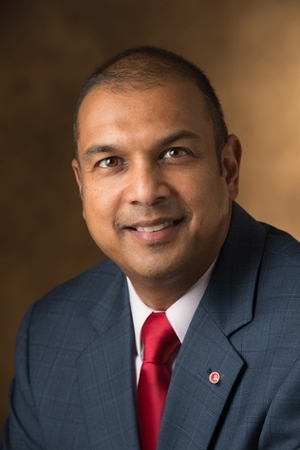 The American Pharmacists Association Academy of Student Pharmacists (APhA-ASP) presented Southern Illinois University Edwardsville’s Gireesh Gupchup, BPharm, PhD, FAPhA, and dean of the SIUE School of Pharmacy (SOP), with its Outstanding Dean Award on Sunday, March 26. Gupchup was honored at the American Pharmacists Association Annual Meeting in San Francisco. The award recognizes school or college of pharmacy deans who have made significant contributions to APhA-ASP chapters and who have promoted, with distinction, the welfare of student pharmacists through various community service, leadership and professional activities. A year before the school opened its doors in 2003, Gupchup was creating the campus relationships that became the groundwork for a pre-pharmacy student organization. Those founding members formed SIUE’s APhA-ASP chapter. Gupchup enthusiastically supports the chapter. He ensures that chapter members secure funding to travel to professional meetings and participate in professional development events, including international exchange opportunities. Gupchup’s leadership has led to numerous innovative academic programs, including PharmD specializations in education and pediatrics, the joint PharmD/MBA degree and the conditional entry program, which assures qualified high school students a spot in the SIUE SOP. Twenty-two affiliated residency programs have been initiated under Gupchup’s supervision as well as interprofessional educational opportunities with the SIU School of Dental Medicine and SIUE’s School of Nursing. Photo: SIUE School of Pharmacy Dean Gireesh Gupchup.